The amount of produce that is wasted in America each year is staggering, which means that millions of dollars in food is wasted each year, both by manufacturers who have surplus crops and homeowners who purchase food that goes bad. But if you’ve got a few brown bananas lying around, bringing them to the local food pantry probably isn’t high on your list. Why not find ways to use your brown bananas so that you can maximize your investment and feed your hungry family? Nobody (except for you) will know that you used brown bananas in this scrumptious recipe. Mix all ingredients together. Place in a greased 9×13 pan or two 9” round pans, bake for 25-20 minutes at 350 degrees. This recipe freezes well. Yes, it’s true – if you can’t use your bananas before they get moldy you can freeze them for up to 3 months. Not only will this recipe prevent you from wasting brown bananas, it’ll disguise these healthy items in a ‘fun’ dinner. Mix all ingredients together and fry on medium heat until brown on both sides. Use brown bananas in a smoothie with yogurt, berries and milk. You can also use frozen bananas for your smoothies. Stack them in a sandwich. Banana-peanut butter sandwiches are a little-known treat but one that is worth publicizing. Brown bananas will maintain a smooth consistency for your sandwich without sliding out of the bread. Banana-peanut butter sandwiches work well with both creamy and chunky peanut butter. For small children, cut the sandwich in half so that it’s easier to hold without the bananas shifting inside. Sari Holtz is a writer for Billy.com and the voice behind Billy’s money saving blog. She is the mother of 4 children between the ages of 6 and 1, and she is always looking for new ways to save money and to trick her children into eating more fruits and vegetables. We freeze them and then use them for smoothies and milkshakes. Delicious! Love this post, we’ve been freezing bananas and using them in fruit smoothies. A friend told me that it makes them creamy, which it does and works great since my son can’t eat yogurt. Kristy, check out my post that I did on “frozen yogurt”, if your son can’t eat yogurt this “ice cream” treat may be worth trying. http://www.justacrumb.com/2010/09/banana-fro-yo.html. We always freeze the brown bananas and use them in puddings and breads later – so easy, just pop them in the freezer with the peel on, no need to wrap them! 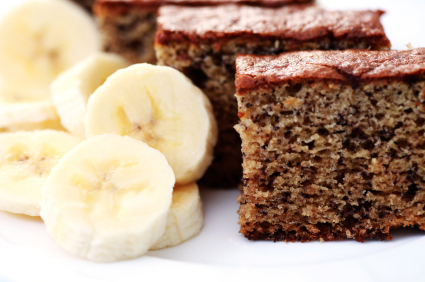 I love using brown bananas in banana bread. We use moneysavingmom’s recipe which freezes great. It even works well if you have only 2 or 3 banana’s instead of the 4. I just add a tiny bit more oil and milk to keep it from being to dry if I use less bananas. Brown Bananas? What are this brown bananas of which you speak? I only WISH I could keep bananas around my house long enough that they would go brown so I could bake with them! Thanks for the tips! But I’m with Lazy Budget Chef, we can’t keep them around long enought to go brown. If I want to use them for bread or something, I have to hide them!! I am always throwing brown bananas in the freezer – as is. I am one who enjoys them “still green” so once they start to turn, it is over for me. And your recipe for the Banana loaf looks much better than mine. Next time, this ‘ll be the one! I was at a restaurant this weekend that freezes them then puts them through a juicer and and it turns into a custard like ice cream consistancy…it was so good! I keep a ziplock bag of brown bananas in the freezer to use to make banana bread or muffins. They make the bread and muffins nice and moist. I just defrost the frozen bananas in the microwave or on the counter when I’m ready to use them. My son also loves to use them for smoothies as other people mentioned. We have a few banana trees in our backyard, so we often get 70-80 bananas all at once! Of course we can’t eat them that fast … so we freeze them. 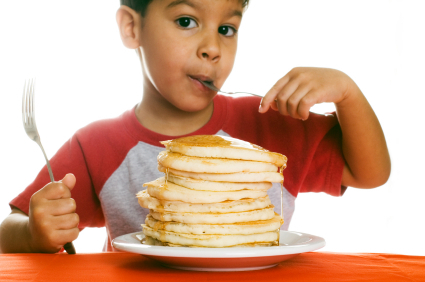 Love the tip about banana pancakes. Those sound perfect for when we have “BINNER” (Breakfast for Dinner)!!! Thanks for the recipe, it turned out wonderful (and I substituted Splenda Sugar Blend)! How do you make smoothies? Also, is it easy to peel the banana once you want to use them out of the freezer? I started making banana pancakes this summer on my own. My family loves them! Now I can’t make plain pancakes anymore. I mush up 2-3 brown bananas, then I use Bisquick and follow the recipe for plain pancakes in the same bowl. I add a little more milk. I then add cinnamon, nutmeg and ground cloves and sometimes some sugar and mix. This is sooooo delicious! Just like banana bread 🙂 I recently tried apple pancakes and did the same thing but diced apples real tiny and added sugar, cinnamon and dash of ginger. So good! I just mashed one up and added it to a bowl of plain oatmeal. It’s so good! use small red apples, to small to bother peeling, core, quarter and grind skin and all in food blender ..Makes wonderful apple sauce all nutrients included with the skins on. Oh, Linda, I didn’t notice at first that you said to core the apples before putting them in the grinder. I was about to comment on the cyanide in the apple seeds. However I definitely agree with throwing them in without the core but with the skins, especially if they were grown without chemicals like pesticides.